A short note from me to the Rainbow Scribe and all readers of this blog. I would not even share the message she received, except that it is addressed by her, courageously, and by Hilarion in his message. In my opinion, the messages that we receive through her are among the very best available to us today. And I very much look forward to them each week. The only constant during these times is change – and one must be ready and willing to move into the direction that one’s reality mirrors back to them as it occurs. By following these signs that show the way, one begins to live a life of cosmic adventure which becomes filled with wondrous synchronicities and occurrences. You must be willing to release old patterns, energies and material holdings when their use, enjoyment and implementation in your life have been fulfilled. In these times, it becomes necessary to do regular purging of many items which have outlived their usefulness and the willingness to pass them on to others who can still benefit from them. Know that the universe always replaces them with something even better and more befitting your soul’s expansion into broader horizons of illuminated living. This practice of regular culling of everything in your life that has old and stale energies will reward you a million times over. You will be amazed at the magnificence that rushes in to take its place. As you begin to understand the concepts of healthy detachment from the things of the physical world, you regain the sense of personal freedom and liberation to live a more sovereign and abundant life. You begin to realize that things are nice to have and enjoy in your life but that once their purpose is done, it is easy to let them go. You begin to know that the world you live in is very rich and that there is always more than enough for all. This also opens up avenues of creativity that may have been blocked before. In every sense, your feeling of aliveness in every moment is increased exponentially. As your inherent internal Light becomes more radiant and luminous, there will be those others in this world that seek to dim that Light so that their level of comfort in their confusion and darkness may continue. Be at peace as you acknowledge their attempt to distract and dim your Light; for you do not owe them the right to diminish you in any way. You are most worthy of all the love in the universe! Send them Light and love and detach from them. No one has the right to put down or diminish another just for the fun of it – this practice or habit has been in use by people throughout the ages and it must stop. ALL are worthy of God’s love and Light! ALL have the same opportunity to grow, learn and expand their understanding of universal laws and to enjoy an abundant life filled with purity, harmony and goodness. You do not have to justify your existence and presence in this world to anyone! You have a right to be here just as much as they do and indeed, it shows great arrogance on their part to assume superiority over you just for being who you are. Be at peace always and know that you are loved and supported by your Family of Light. Take proper time to discern what is actually occurring when it happens and do not engage this negative energy. It is unfortunate that these psychic attacks can and do still occur but you are becoming more proficient in distancing yourself from them without incurring karma for your soul. Set your sights and your standard of conduct at the highest level and never look back or sideways when there are attempts made to diminish your Light and lead you astray from the spiritual path and discipline you have chosen. Do this without judgement, just knowing that it is not for you to partake of this energy that tries to displace you from your own healthy sense of self esteem. By this action, you enable others to free themselves from similar situations that might occur in their lives. This is how the Light of the Divine grows and expands upon your world. Notice is hereby given that the creation of videos by people other than the author/channel/scribe of any messages from this author/channel/scribe is prohibited unless authorized by her. 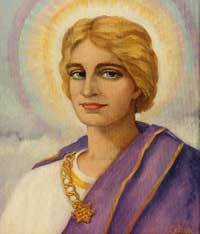 The Reason: Master Hilarion has indicated that the Scribe/Channel is a direct conduit for his energies as she speaks through the words and these energies go to all who are in need of them as they listen to the words and/or read the text message received by her.